Southampton is a vibrant and well-connected, dynamic city. Home to two universities, there is a population of over 30,000 students. Our students benefit from campuses based in and around the city, all connected with award-winning transport links. One of Britain’s top five cities for economic growth. £1.6bn has gone to develop the city, with a Cultural Centre being built and a new £70 million leisure complex. This facility includes new entertainment venues, restaurants, cafes, a luxury cinema and shops. This is part of a £3bn master plan to help develop and improve the city. Excellent for sailing and water sports. As part of the Solent, Southampton is a great place to take part in a variety of water and sailing sports. The University’s Water Sports and sailing centre page lists all the available watersports activities and courses. Escape to the park….or the forest. Southampton has over 50 parks and green spaces. Our Central Parks have recently been awarded the prestigious Grade II* listed status on the Historic England Register of Parks and Gardens of special historic interest. Southampton is just 15 minutes away by train to the heart of the New Forest National Park, known for its heathland, forest trails and native ponies. 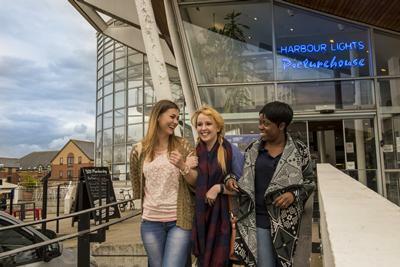 Southampton is home to four venues where you can see plays, performances and musicians: The Mayflower, The Guildhall, The Point and the Nuffield Theatre which is supported by the University of Southampton and located at Highfield Campus. The O2 and The Joiners have hosted some of Britain’s popular bands and are popular student venues. There are four cinemas in the city centre and one on Highfield Campus, all connected by Unilink bus network. Visit Discover Southampton to find out more about events in the city. During the day, you might want to visit Portswood High street and other locations in the city which have a range of cafes and restaurants. Southampton has a very active nightlife. There is a great student atmosphere due to the number of nightclubs and pubs across the city. The student union run Stags Head pub on Highfield Campus hosts karaoke nights and sports screenings. The Bridge also runs evenings of alternative music and stand-up comedies. From Southampton, you can travel to cities across the south by train or ferry. You can visit popular cities such as Bournemouth, Brighton, London and Portsmouth from Southampton Central train station. Southampton Airport and Red Funnel ferries give access to international locations.